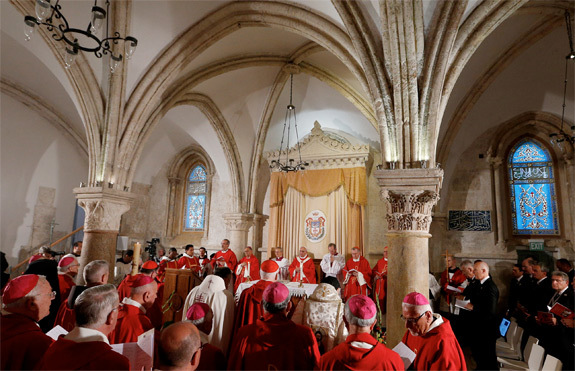 "The Church, in her going forth, preserves the memory of what took place here…"
From Vatican Radio, the homily given by Pope Francis during Mass in the Upper Room (the cenacle) in Jerusalem today, the last day of the Holy Father’s three-day pilgrimage to the Holy Land. It is a great gift that the Lord has given us by bringing us together here in the Upper Room for the celebration of the Eucharist. Here, where Jesus shared the Last Supper with the apostles; where, after his resurrection, he appeared in their midst; where the Holy Spirit descended with power upon Mary and the disciples. Here the Church was born, and was born to go forth. From here she set out, with the broken bread in her hands, the wounds of Christ before her eyes, and the Spirit of love in her heart. In the Upper Room, the risen Jesus, sent by the Father, bestowed upon the apostles his own Spirit and with this power he sent them forth to renew the face of the earth (cf. Ps 104:30). The Upper Room speaks to us of service, of Jesus giving the disciples an example by washing their feet. Washing one another’s feet signifies welcoming, accepting, loving and serving one another. It means serving the poor, the sick and the outcast. The Upper Room reminds us of friendship. “No longer do I call you servants – Jesus said to the Twelve – but I have called you friends” (Jn 15:15). The Lord makes us his friends, he reveals God’s will to us and he gives us his very self. This is the most beautiful part of being a Christian and, especially, of being a priest: becoming a friend of the Lord Jesus. The Upper Room reminds us of sharing, fraternity, harmony and peacevamong ourselves. How much love and goodness has flowed from the Upper Room! How much charity has gone forth from here, like a river from its source, beginning as a stream and then expanding and becoming a great torrent. All the saints drew from this source; and hence the great river of the Church’s holiness continues to flow: from the Heart of Christ, from the Eucharist and from the Holy Spirit. Lastly, the Upper Room reminds us of the birth of the new family, the Church, established by the risen Jesus; a family that has a Mother, the Virgin Mary. Christian families belong to this great family, and in it they find the light and strength to press on and be renewed, amid the challenges and difficulties of life. All God’s children, of every people and language, are invited and called to be part of this great family, as brothers and sisters and sons and daughters of the one Father in heaven.